Batchelors Way: Our Haunted House!! Yes, it's that creepy time of year again!!! 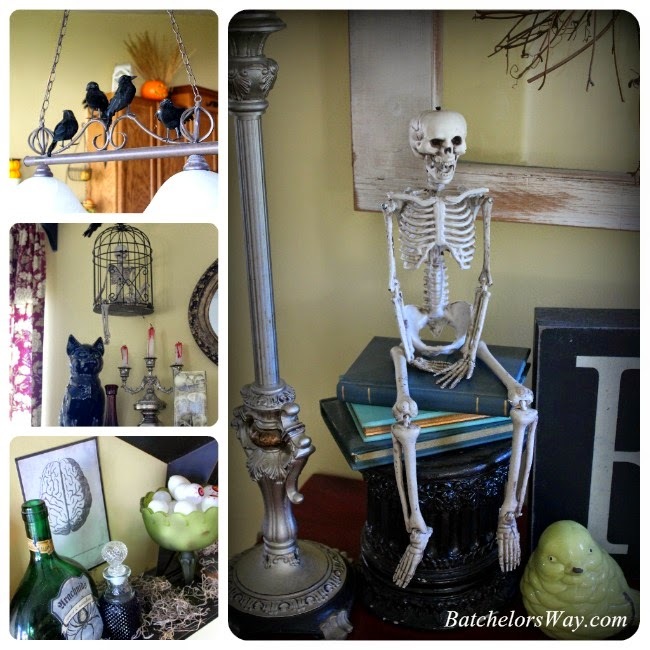 If you have been following my blog you know we might like Halloween a little lot. 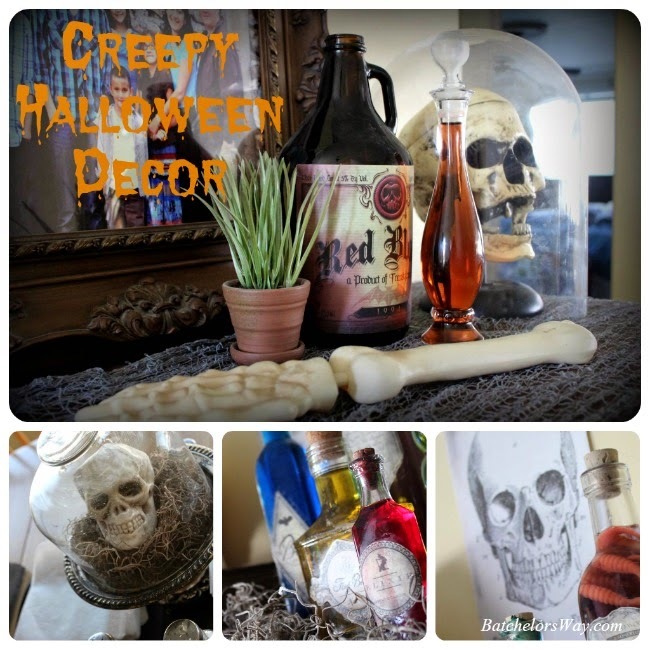 I have posted about our Halloween decor before here and here and here. The other day someone asked me if I put up all our Halloween decorations in the same place and the same way every year. and last of all, that's boring!!! This year Jaysen offered some of his new finds to be put on display, such as this awesome mounted skull, which fits perfectly under my giant glass dome. Love this creepy vignette. I put most of our collection of jars full of potions on the kitchen shelves. Every kid's favorite thing is to pick a color and fill a potion jar each year. We collect these from second hand stores all year and add a few new ones each year. Moving things around just makes each year fun and exciting for the kids. They love to come home after school and look around to see what's where and what's new!! My favorite new thing is our Haunted Photo Collage. I bought a couple of these cheap lenticular pictures about 5 years ago. Since then, I have added to my collection. Most are from the Dollar Store. I bought three new ones this year and decided they would make a better impact all together. And collage walls are so trendy, Why not a creepy trendy wall!! My mother hates it, too creepy!! I just might do this idea again next year!! Hi there! I am just getting caught up with my blog reading and while I am not really into Halloween decorating anymore that my kids are 20+ and we have very few trick or treaters, I kinda go all out for every other holiday. The one thing you said really struck home with me, you don't always put stuff out the same way. I am a victim of this-especially at Christmas. One, I can't bring myself to NOT put everything out and a piece of me feels like it's tradition.Each room kinda has a theme. But, now that I've started following all these blogs, I get new ideas and let's just say, I have a 5 ft H x 22ft x 13 ft crawl space off of my finished basement that is filled top to bottom with totes-mostly Christmas. My husband is ready to leave me... So, feel free to do more posts about how to get around the tradition feeling and changing things up a bit!